The AMC is done! PHEW! Today was the AMC 10/12 B contest. Another teacher and I in the department organized it … and we got 123 kids to take it! 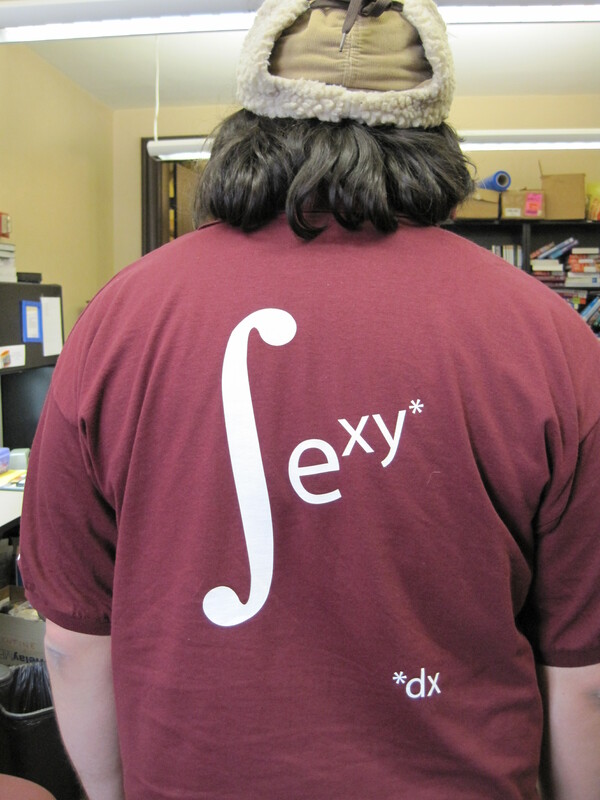 This is a t-shirt that the math club leaders designed and ordered. The math clubbers all wore them today! SOLIDARITY! More than anything, I love the fact that 123 kids thought about math for 75 minutes after school. My favorite moment from today was watching kids discuss problems after the contest ended. I mean: if they did that, then they cared. Going through this AMC push a second year in a row also reminds me how hard it is to organize something well. I’d say that I spent between 10 and 20 hours making sure that this one contest was successful. Congrats! Seems like quite a feat and exciting! On the 12A (2 weeks earlier) the first few questions were unusually easy, and the last 5, I thought, were unusually hard. Participation this year slumped from over 100 last year down to 20 – it’s all on one person to organize and push, and I just didn’t pound the importance the way I did last year. Thank you for letting me know… I was hoping that after a few years, I wouldn’t have to “push.” But it sounds like it’s something that we have to continuously work on to make happen. I wonder what other things institutionally we can do to make the school and the kids more geared towards these sorts of things. Remember, you get a whole new crop of kids every 4 years, so institutional memory relies on the faculty, much more than on the kids. If you get all the math faculty telling the kids that everyone who is in the top half (or quarter, or whatever you want to make the ongoing fraction be) should take the AMC exams, then it will continue without a huge push. If the faculty don’t all do it, then a few faculty have to push hard to reach the students who are not being told by their teachers. We made the test a requirement for our Advanced students this year. This certainly got them out there (duh), but there were certainly a few who were just frustrated by the whole thing. Next year, we’re thinking of requiring our Advanced sophomores to take the 10, and letting the 12 be optional. That way, they’ll all at least get the chance to see if this is the sort of thing that they would enjoy. It will be interesting to see how many opt for the 12. It is certainly fun to see them all buzzing about the questions afterwards. I’m having a good time working through them myself! We have a few kids that take the Michigan test every fall, but I would like to see more. Like you, I am very interested in a cultural change with regard to how math and math competitions are viewed in our school. Since we have a group of students already testing, I feel the next step is to get a math club started, but have not been successful in my attempts. Any suggestions??? 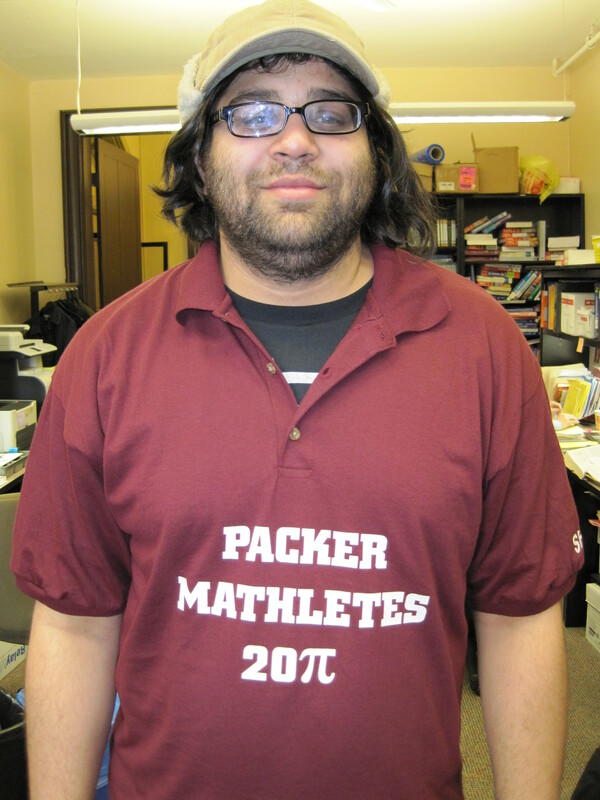 @Keninwa Math clubs usually fail because the strongest mathletes have a full plate of extracurriculars and would rather add Mu Alpha Theta to their transcripts by doing a few hours of tutoring than to spend time after school training as hard as they did in middle school with the Mathcounts program. We still do the math contests and I WISH we could get the turnout that Sam was able to pull off–Mr. 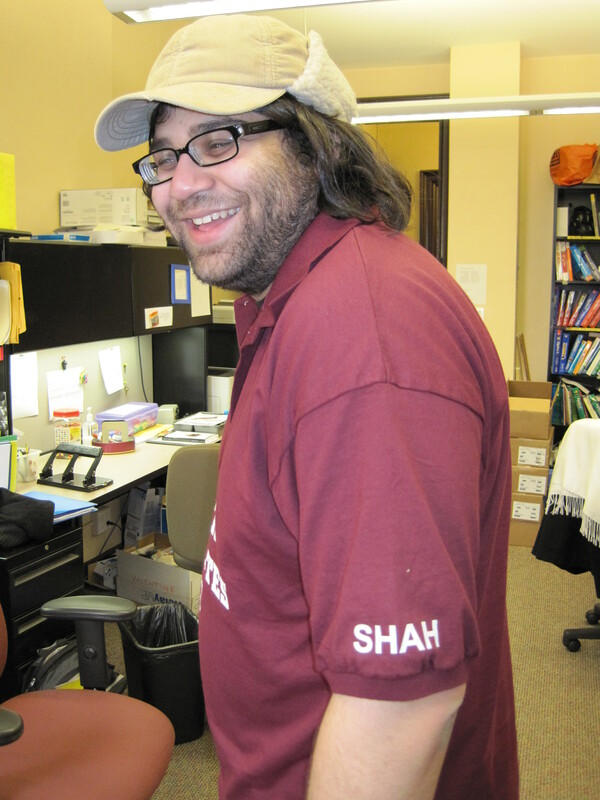 Shah you rock! But we are in the process of recruiting some university math professors, both locally and chatting via Skype on our Smartboard, to help us in getting a “Mathematics Research Society” up and running come the fall. This will open things up to the interested-in-math-non-honors students who feel like the contests are beyond their abilities and will hopefully look more impressive on their transcripts than “math club,” considering that the students will be doing authentic mathematics research. I totally agree with Paul re: “Math clubs usually fail because the strongest mathletes have a full plate of extracurriculars.” We have kids who love math, but they love a lot of other things too. And we only get 25 minutes once a week to meet with our math club. It is small, and in terms of getting students to practice math and see it in a new way, it doesn’t quite work. They don’t have time to do problems outside of math club and then present solutions inside math club. I have been thinking about creating a math seminar which meets twice a week (for some small credit) where I can give homework and interested math kids can apply to sign up, but I doubt it would get approved by my school. Just because it’s a good idea doesn’t mean it’s a good idea to implement. i just gave and scored the colorado math league contests to my 6th,7th,and 8th grade students. I am currently taking each of the contests myself to see if i can score better than my students!! i am wondering how i can effectivly go over some of the good questions with my classes. So far, some of the 6th grade questions are …TRICKY!!!!! My son’s high school (about 1100 students) had 3 or 4 take the AMC 10/12 this year. The teachers don’t provide much support for contest math and give so much drill in the “advanced” classes that most students have trouble just getting the homework done. I tried to get this going in my school this year, and failed completely. I had 4 students interested, and I had to pay for it all myself, and it just didn’t seem worth it. Admittedly, I’m in a tiny charter school in south LA pulling from the kinds of populations that’ve never heard of MathCounts, but it still seemed worth doing. Hi Malcom! Yeah, the big thing for us was that I got all the teachers to offer some good amount of extra credit. Some did 5% to a low test score, some tied the extra credit to how well the student did on the contest. Our kids are motivated by grades, but also, they run to extra credit like rabbits to carrots. It’s a strange phenomenon. That’s how we got the interest. Then we kept on announcing it, talking about it, emailing their parents letting them know how cool it was their kid signed up, etc. That’s how we got the turnout, methinks. Oh yeah, we also never talked about the test like it was measuring intelligence, or it was only for “smart kids.” We talked to kids about how they’d be thinking hard for 75 minutes, and that’s what we cared about. Not their score. The fact that they’re willing to think. We teachers think that’s awesome. That was my message, anyway. I have a love hate relationship with contests. Yes, they mean that students are volunteering (or not) to think about math for some period of time outside of class, but they tend to fit within narrow definitions of what it means to be good at math (quickness & fluency with notation and vocabulary to name two), reinforcing societsl norms and heirarchies. Few contests are collaborative. Few involve creating or exploring extensions. Personally, I proctored the amc 12 this year and only found a few questions interesting enough to work on myself. The AMC tests do rely on quickness, since they are tough and timed, but not so much on notation. One would not want to build an entire curriculum around contest math, but it makes a nice counterpoint to the over-emphasis on group work in the mainstream math classes here. More than anything, I love the fact that 123 kids thought about math for 75 minutes after school. My favorite moment from today was watching kids discuss problems after the contest ended. Even if it does not happen more than once in a while, it will stay with them. You did great! Thanks Elizabeth! And I’ll let the student designer know that her designs are appreciated. I personally am in love with them too!